This is supposed to be all ‘about us’. But at Andrew Mazzone Design Jeweller it’s really ‘all about you’. Sure, we can tell you we have fantastic staff and a highly experienced team of designers, jewellers and gemmologists who we treasure, but our most precious asset is you – our customer. It’s a value we hold dear and one that has contributed to our 50 years of success. Our reward is a loyal and ever-growing customer base appreciative of our high quality service and craftsmanship. At Andrew Mazzone Design Jeweller we’ve built our reputation on creating exquisite jewellery, incorporating unique designs with great attention to detail. We pride ourselves on our stunning custom-made engagement, wedding and eternity rings. 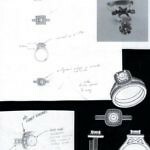 As a matter of fact, designing them with our clients is our passion, which is why we are regarded as the Ring Specialists. So come in and let our friendly team show you our collection. Starting with an intimate consultation, the studio offers a detailed drawing or computer-aided design so that you can visualise your special piece before it is made. Once a design is agreed upon, you can select a perfectly cut diamond from Andrew’s collection, to be set in your choice of precious metals, including platinum. The studio also houses a stunning range of jewellery sourced from around the world. Holding one of Adelaide’s largest ranges of 18ct Italian gold jewellery. We also stock well known brands such as Adami & Martucci, Von Treskow, Story, Ellani, Najo, Pastiche ,Dora and Infinity along with gents’ jewellery and more.